Bollywood Movies has always been fond of “Friendship”.And when it comes to friendship,”Teen kaa Jadoo” does miracles.There have been many amazing and inspiring Triplet films of bollywood which have changed the perspective of how we see friendship and relationships.So,here are they,the best five Films of bollywood which had three main actors also known as Triplet films. Not the recent David Dhavan film,but the classic 1981 romantic comedy-buddy film starring Farooq Shaikh, Deepti Naval, Rakesh Bedi, Ravi Baswaniand Saeed Jaffrey.And if you had thought that the recent Chassme Badoor was a new film with a fresh plot,then watch the trailer of The 1981 film,which had the same story with many same scenes.The 1981 movie had Siddharth (Farooq Shaikh), Omi (Rakesh Bedi) and Jai (Ravi Baswani) who are close friends and room mates who are studying at Delhi University. g the problem, the three friends go to locations in the country where each friend chooses a sport for the group to attempt. This movie has a very deep effect on todays generation as it had brought a wave of new ideas into the film industry.This film was directed by the multitalented Farhan Akthar.The plot of the story goes like this : Three young men Akash, Sameer, and Siddharth are close friends, but their tastes and characters are completely incompatible. So when Siddharth falls in love with a much older woman, Tara, a woman who has been unsuccessful in keeping her marriage intact as well as alcohol-dependent, widens the rift between the trio, forcing them to part company. Years later, the trio will be re-united, they will be much mature and understanding, but will they still accept Siddharth love for Tara, especially when they themselves have fallen in love with women around their respective ages? You thought that this is going to be on the number one spot.But there is another classic cult sitting there.This movie directed by Rajkumar Hirani is till date,the highest grossing film of Bollywood.It was loosely adapted from another Chetan Bhagat Novel “Five point Someone : What not to do at IIT’s”.The plot,well almost all of you have seen this film. This film was remade in Tamilas Nanban (2012) which also received critical praise and commercial success. It has also been announced that there will a Chinese remake of the film produced by Stephen Chow and that there are plans for a Hollywood remake produced in the United States. Ahh..and here it is.One of the best comedy fims ever made in the history of bollywood. Hera Pheri is a 2000 Hindi Cult comedy film directed by Priyadarshan starring Akshay Kumar, Paresh Rawal, Sunil Shetty and Tabu. The story is based on the 1989 Malayalam film Ramji Rao Speaking, which was also remade into Tamil cinema as Arangetra Velai . The film spawned a sequel, Phir Hera Pheri, released in 2006.
is my favorite movie, thanks for this educated articles.. I WILL VOTE FOR "3 IDIOTS" AS A BEST MOVIE OF ALL TIME. 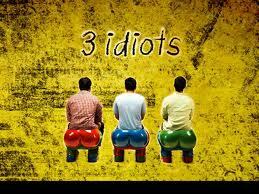 THE MOVIE SO TOUCHING AND BASED ON TRUE FACTS..
Yes,you are right.I dont know when a movie like "3 Idiots" will come. 3 Idiots the only movie I love. thank you so much Abhijit Mahida for this awesome article.